Sing ‘n Speak Spanish® is typically offered once or twice a week as an enrichment course. It gives students a foundation of vocabulary, grammar structures, and pronunciation. This sets them up for success when they take more rigorous courses in junior high and high school or when they have a chance for full immersion. It takes about a 1,000 to 3,000 word vocabulary to become minimally conversational in a foreign language. Each course introduces 300 – 500 words/phrases depending on the level of Spanish. By the time students complete Year 5 Spanish, they understand a great deal and can have simple conversations. The Sing ‘n Speak Spanish® curriculum is extensive, with a full Scope & Sequence for K – 8th grades assuming once a week instruction throughout the school year. The Scope & Sequence chart below illustrates how to incorporate this Spanish program into your school. Follow the chart diagonally from top to bottom to see how a child progresses from year to year. 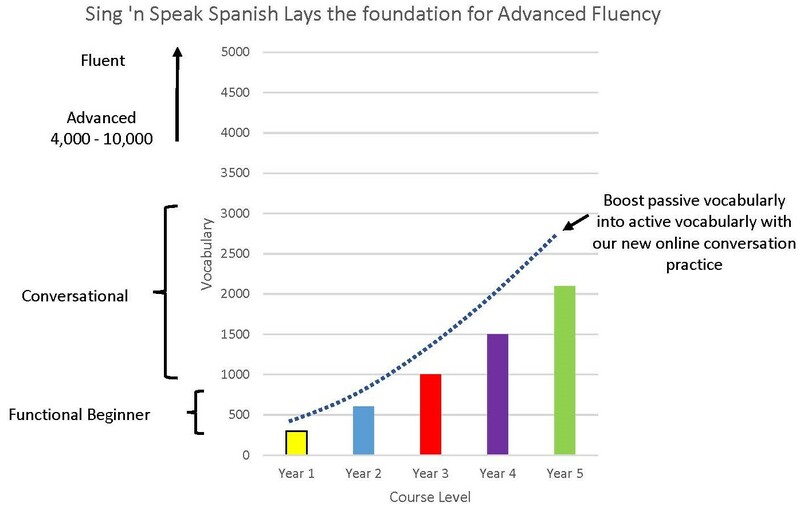 As an example, the chart highlights the sequence for a child starting Spanish as a Kindergartener all the way through 8th grade. Notice that Year 1 Spanish is labeled as Year 1A, 1B, and 1C. Year 1A and 1B courses are taught with the Year 1 (K-5) curriculum, with a higher level workbook and music CD for Year 1B students. Second graders can begin with either Year 1A or Year 1B. The lesson plans suggest ways to lower or elevate the level of instruction to match the students’ abilities. The Year 1C course is taught with a separate but parallel Year 1 (6-8) curriculum with higher level activities, additional grammar, approximately 25% more vocabulary, and a higher level workbook appropriate for older students. The Sing ‘n Speak Spanish® curriculum is versatile. The Year 1 – Year 5 courses each consist of 28 – 32 hours of instruction packed with numerous activities. You can teach the class at a fast pace, pick and choose from the activities, and complete the course in as many lessons. You can also stretch the program easily by doing more of the activities in each lesson, doing the workbook in class, adding assessment, and/or including special cultural themes from time to time. The Scope & Sequence chart below assumes once a week instruction and would change if the curricula were taught more frequently. The Year 6 and Year 7 curricula cover a great deal of vocabulary and grammar and each typically take two years of instruction assuming a once a week lesson throughout the school year. For this reason, the Scope & Sequence Chart lists Year 6 as Part 1 & Part 2. 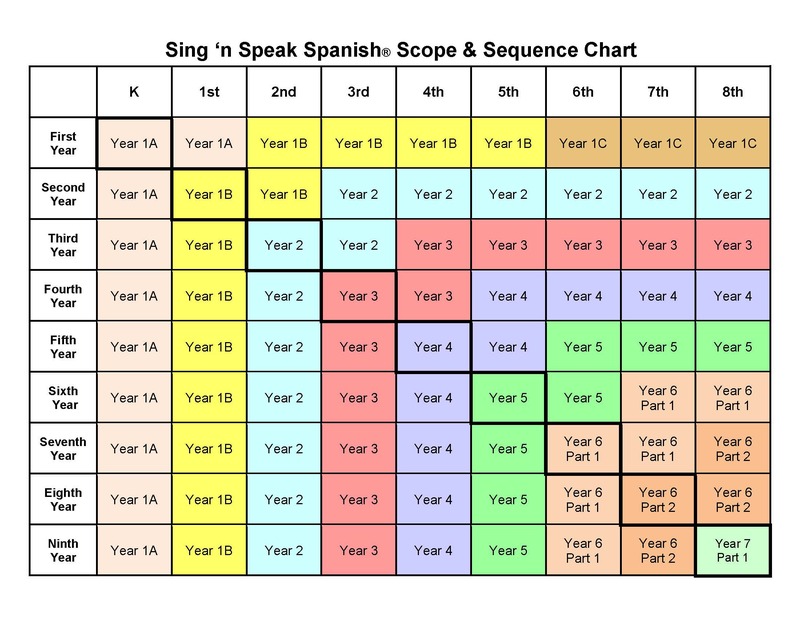 By adding Year 7 Parts 1 & 2 and starting the students’ Spanish education in 3rd or 4th grade, the chart could easily become a 4th – 12th Scope & Sequence chart. Go to Support Materials to learn more about the Year 6 and 7 instructional materials.